Preaching the gospel to more than the local church is made possible using the latest technologies. 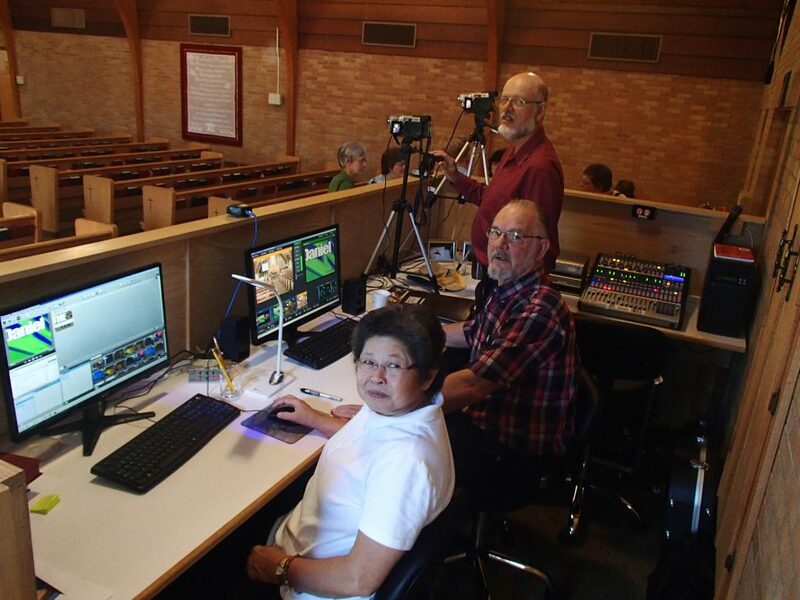 Since we are commanded by Jesus Christ to "preach the gospel to all creation" our church has for many years made video recordings of our services and broadcast them over the local cable religious channel 18 several times a week. This has been for all practical purposes the only way we could do more to reach those who do not attend our Sunday services. Our current method of video production consists of directly recording the complete Sunday services on DVDs which are then taken to another location and loaded onto the Channel 18, local cable religious channel, for broadcast several times a week. Because of resource limitations, we cannot do any post-production work to improve or enhance this broadcast. We’d need to be able to turn the production around before 7 PM, which gives us a little over 6 hours after the second service. We do not have anyone willing and trained to do such post production. if you would like to volunteer for service in our video production ministry, click here. For several years, we have had an internet presence in the form of a web site. Because of lack of resources, this site has never blossomed into a means of reaching a wider audience with the Gospel. However, in the past year, we have seen a resurgence of interest, particularly by our Pastor, to have at a minimum, the weekly sermons uploaded to our web site. This along with a redesign of the site itself has been accomplished and this site is the result. We currently list the sermons grouped by series as you can see on the Sermons Page. We actually upload the sermons to You Tube and link them to the web page. All this takes work to extract the sermon from the recorded service video, post-produce a finished sermon clip using additional leader and trailer clips, and then upload the finished clip to YouTube and link it to the Sermon Page at the appropriate location. This whole process is not overly complicated and can be learned by anyone already familiar with PCs. Those who have used YouTube to any extent will likely understand the upload process. Our church has also had a Face Book page for a few years, but until Pastor Phil arrived, it had languished for lack of someone to update it. He has done this for the past year, and now we have it linked to this web site so that those going to the Face Book page can then come to this site for more in-depth information as well as viewing the sermons, both past and present. if you would like to volunteer for service in our web site ministry, click here.